ChemBuster - the remedy for Chemtrail Health Problems! Chemtrails cause Chronic Health Problems. And the problem is growing. Your symptoms and health problems are not in your head! Chemtrails is a very real cause of many health problems in America and around the world today. 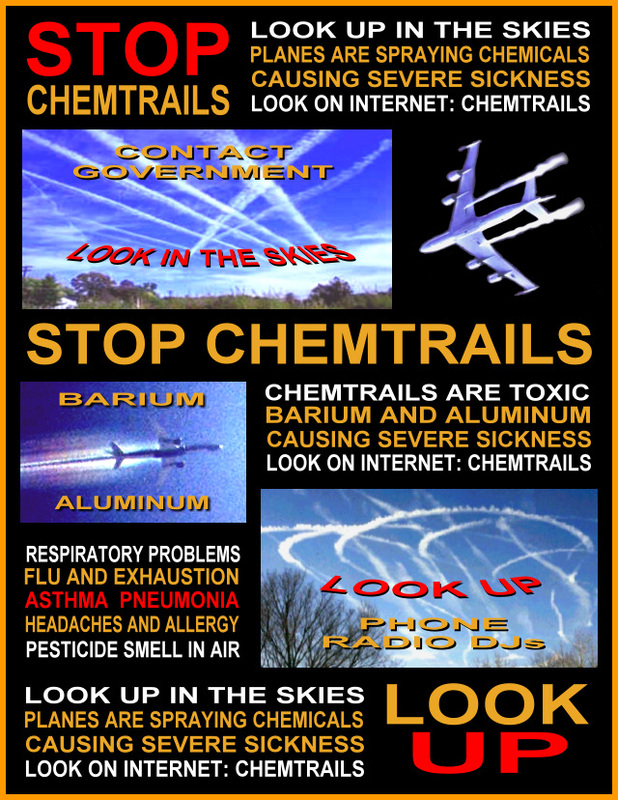 For information on how Chemtrails affect your health, read on. Do you have flu-like symptoms, malaise, respiratory problems, or immune problems? Have these appeared in the past few years . . . Seemingly out of nowhere? If so, you may be a victim of chemtrails. Chemtrails spraying is going on around the world around the clock. For what?. 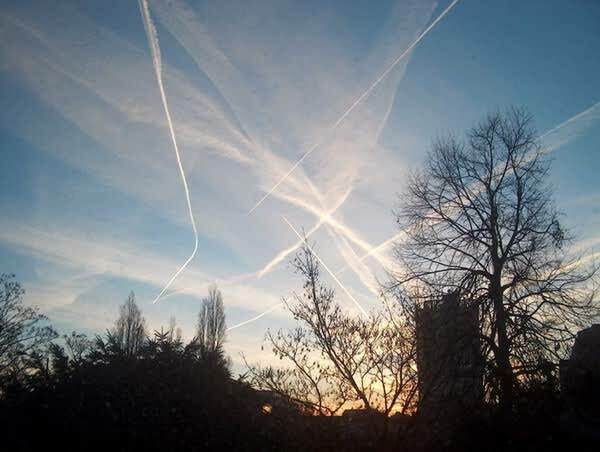 Many people have developed strange symptoms and chronic health problems following the spraying as the various constituents of the Chemtrails have fallen to earth. These constituents have been particularly identified as barium and mycoplasmas. Whether the mycoplasmas are part of the original spraying or become attached to the particulate matter of the Chemtrails is unknown. Washington reporter Mike Blair wrote that what has been dubbed "chemtrails" is actually "anti-bacteriological warfare chemicals being tested by the federal government." It has been reported that this program gained its legality from US Code Title 50, Section 1520, which gives the Secretary of Defense authority to order testing "involving the use of a chemical agent or biological agent on a civilian population" for research purposes. On October 2, 2001 Congressman Dennis Kucinich, Ohio introduced H. R. 2977 during the 1st Session of the 107th Congress of the United States. The "Space Preservation Act of 2001" seeks to "preserve the cooperative, peaceful uses of space for the benfit of all humankind by permanently prohibiting the basing of weapons in space by the United States, and to require the President to take action and implement a world treaty banning space-based weapons." In the bill Chemtrails are listed as an "exotic weapons system". Are your health problems caused by germ warfare or government experiments? If so, what can you do about it? Samples from these chemtrails were analyzed by a facility in Victoria, British Columbia, which is licensed by the U. S. Environmental Protection Agency (EPA) and found to contain in addition to JP-8 jet fuel (possibly the carrier medium which contains the additive ethylene dibromide, banned as a pesticide due to causing severe respiratory reactions even at low levels) numerous pathogens, disease causing agents. These included Pseudomonas Aeruginosa, which not only causes respiratory infection but also attacks the immune system; Serratia Marcescens, an antibiotic-resistant bacteria which causes pneumonia, endocarditis and meningitis; as well as Streptomyces and molds capable of inducing heart disease, upper respiratory and gastrointestinal ailments. Have you experienced symptoms of unknown origin? A story came from a retired police and military pilot in Oklahoma who witnessed KC-135 and KC-10 military craft crisscrossing the sky near his home in mid-January. Later he became ill and learned from his doctor that the local hospitals were overflowing with patients suffering from flu-like symptoms. Checking with his former National Guard unit, this man was told that no one knew anything about the craft and their trails but that they had been ordered not to fly in the area of the craft on the days in question. Chemtrails spraying started in 1999. To this date no one has a definitive answer as to why the spraying is going on, nor why people are developing all sorts of odd health problems and complaints following spraying. Anyone who has been accustomed to looking at the sky knows that in early 1999 the chemtrails began making almost daily appearances in all these regions, turning the sky into a big tic-tac-toe game, with sometimes six or eight white, very quiet jets seen at any given time, all day long, flying at altitudes far too low to leave contrails.. The United Nations is the only organization I'm aware of that flies white, unmarked aircraft and the spewplanes fly low enough to be easily dentified with binoculars. I was living in Des Moines, Iowa, when this started and on the first day, few people noticed the bizarre display in the sky but everyone was talking about the sudden rise in respiratory illness and deaths among the elderly, infirm and infants there. After the first spraying, my neighbor, a retired truck driver in his seventies, looked like he was about to drop in the driveway from coughing and he had a deathly pall, so I asked him to use one of my zappers. Thankfully, he did for an hour or so and the next day his complexion was rosy, he otherwise looked like a million bucks and was vigorously shoveling snow. A couple of months ago, Doc von Peters agreed to formulate a remedy specifically intended to reverse the effects of these assaults and I distributed fifty samples of the 1-ounce bottles to selected customers, known personally by Carol and I, who fit the profile of the typical sufferer of this widespread malady. I gave it a month in order to get the feedback I needed in order to decide whether to sell it on our site, www.worldwithoutparasites.com and the results were so confirming that I'm very pleased to offer it for sale to anyone who has bought a zapper from me or from any other zapper manufacturer. In fact, this little bottled remedy has far exceeded our expectations, as well as Dr von Peters'. We now sell this to people who have suffered from chronic conditions since long before 1999 and they're getting overwhelmingly positive and confirming results. In most cases, only one bottle is needed to restore people's vitality and health, I'm very happy to report. It is known that more and more people are developing strange chronic type conditions which are generally unresponsive to standard medical care, as well as to herbal treatment, due to internal toxic changes in the body. 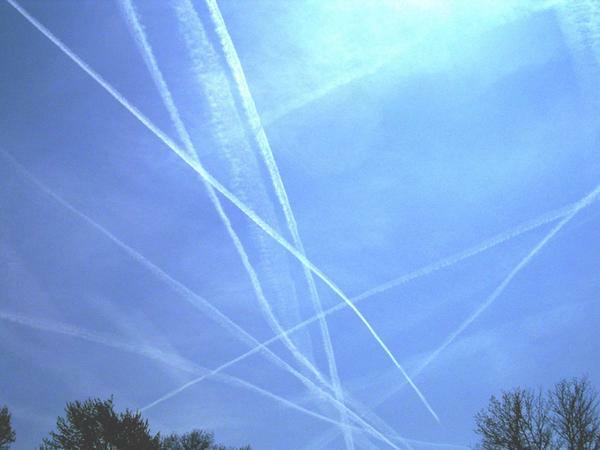 Chemtrails are also affecting the life or bio-energy, resulting in severe fatigue and weakening. Dr. Wilhelm Reich was a major researcher into what he called "orgone energy" which is part and parcel of all life on earth, and may well be God's natural energy of life which pervades the earth and its atmosphere. While known by several names including orgone, life energy, bio-energy, etc., it is believed that the Chemtrails spraying is upsetting the balance between orgone energy and its negative counterpart D-Orgone which has a life-sapping effect. Further, Reich showed that an adequate amount of orgone energy must be absorbed by the body to maintain health and normal physical and mental function. This is notrmally done through healthy air and sunlight and contact of the skin with the earth itself. It is stated by some that Chemtrails spraying is blocking the absorption of this energy as well as blocking body function necessary to proper nutrition, elimination and absorption of necessary elements. Your Chronic Illness Can Be Helped! An Answer to Your Health Problem? Chembuster is designed to combat and break through this problem. Dr. William von Peters, America's top credentialed alternative medicine specialist, at the request of Don Croft, developed this formula. It took Dr. von Peters 6 months of reading, research, and trial and error before in an inspired moment it all came together -- along with a special method of infusing into the remedy the ability to be energized by orgone Bio-energy. In the testing phase, conducted by Don Croft, ChemBuster was given to 50 individuals. After being on ChemBuster for 2-3 weeks these individuals began to report back astounding testimonies of near miraculous healings -- after they had practically given up on ever being well again. ChemBuster contains 4 herbals and 9 homeopathics blended in a proprietary process designed to defeat, to annihilate, the pools of mycoplasma, heavy metals, respiratory problems and even mental problems associated with Chemtrail poisoning. I developed this remedy as a "silver bullet" to help the people of the world recover their health and well being. It is specifically designed to quickly move the body back into healing mode so that the body regains the ability to heal itself. Specifically Chembuster is a HomeoHerbal© preparation*. HomeoHerbal© products are a combination of homeopathic remedies and herbal remedies blended especially to obtain a higher level of healing capability in a single product. Homeopathics largely operate through their energy signature patterns which the body recognizes through its electrical and nervous system. Herbals contain the food and nutritive values of the herb, and work through the digestive and alimentary system. When these are combined according to Dr. von Peters' method one gains the best of both systems enabling a more rapid healing response even in situations where no response has been noted previously. In addition, Chembuster is the first remedy designed to be able to be potentiated in its effects by the absorption of orgone energy prior to being taken into the body. Why is the infusing of orgone Bio-energy important? Because Dr. von Peters has found that the life energy of Chemtrails victims has been sapped by the microplasma. Without sufficient life energy there can be no healing. No other remedy before ChemBuster has had the capability of infusing orgone Bio-energy into its structure. In this ChemBuster is truly revolutionary. We continue to hear from people like yourself, as well as practitioners, around the world who have found that ChemBuster was the "silver bullet" their body needed to heal. At the end of 2004, I had a very bad cough. I have never had this kind of cough before and being in natural medicines, I knew that it was not a naturally occurring cough. Nothing I know could stop it. I realized that it was coming from the poisons of the chemtrails (probably barium among others) - which are heavily sprayed over Geneva as they are in so many countries. I ordered your ChemBuster preparation and I started to take 6 drops of it 2 times a day. I felt much better almost immediately. After 3 or 4 days, the cough had stopped completely. (Unfortunately, I didn't think to note the exact number of days, but I remembered saying to myself: That was quick!..."). To potentiate the remedy (by infusing orgone bio-energy), the bottle should be placed near an orgonite device such as a Terminator II Zapper or Tower Buster for 5-10 minutes prior to administering the remedy in order for it to be able to be fully charged with orgone when taken. This results in increasing your personal life energy which allows a deeper and faster effect within the body and moves the body into a healing response by removing the blockages caused by the Chemtrails spraying. Sensitives have said that placing the Chembuster near orgonite results in 10 times the strength on the energetic level than if just taken as is out of the bottle. Again. this ability to be potentiated by orgonite was deliberately programmed into Chembuster to break up blockages and restore the body's natural healing ability. Yet, as it works with natural orgone energy it is not harmful to the body. We have used your Chembuster with great resultsâ€¦I was sick with upper respiratory illnesses since landing in San Diego until I took the Chembuster. Haven't been sick since. Thank you very much for your contributions to true healing. In practice, we are hearing testimonials of near miraculous healing from this powerful remedy. People have reported blood pressure normalizing, blood sugar dropping by over 50% and ending the need for injectible insulin, joint problems and pain disappearing, liver and kidney complaints healing, and more. These anecdotal stories from users indicate the quality of the product, and its ability to help the body normalize and rid itself of toxins. Silybum marianum 6X and Ã˜ - Action on the liver. Echinacea Augustifolia - 6X and Ã˜ - Systemic purifier. Cayenne 6X and Ã˜ - Action on the mucal system. Hydrastis Ã˜ - Systemic purifier. Comes in a one ounce bottle. Recommended dosage is 6 drops twice daily or as recommended by your Health Professional. What is your health worth? The suffering is immeasurable from a dollar standpoint. Nevertheless, chronic health problems can cost in the tens of thousands of dollars... With no relief! Pharmaceutical medications typically run hundreds of dollars per prescription. Natural remedies of this quality normally run in the $50.00, $100.00 and up range. However, because of Dr. von Peters' commitment to world health and suffering Vets this product has been priced for everyone's affordability at $27.00 per bottle. I...have been using it for about 3 weeks now...and have not experienced any illness as many others around me have. Lots of people are coming down with flu, colds and chest infections. Thank you for all your dedicated work in the healing field. To help us get the important information out on ChemBuster we are making a special Internet-only offer to you. Try ChemBuster yourself, recommend it to your sick friends and relatives and, after saving $2.00 on your first bottle you will save an additional $17.00 on your second bottle as a "thank you". This saves you $19.00 on two bottles! [Note: The links below will allow you to set up your account at Life Quest® Formulas, Inc. so you can then purchase ChemBuster at the Internet Special rate. Otherwise you will see the special price, but you will be charged the retail price. So fill out the customer form, and then click on "Specials" on the RIGHT side of the page. Special Price - $25.00 from Life Quest® Formulas only. Special Price - $35.00 from Life Quest® Formulas only. P.S. Don Croft has been in the forefront of the fight against Chemtrail disease with his introduction of portable zappers. Don recommends ChemBuster to all his clients. You should try ChemBuster for your health challenges too! Want more information about Chemtrails? Here is a Las Vegas story on them and their terrible health effects. Click Here for Story. Update: Dr. von Peters recommends the potentiation of ChemBuster for at least 5-10 minutes to increase its bioenergy. Some people have been reporting even more results from super-potentiating ChemBuster by leaving it on an orgonite device, such as a towerbuster, for 2 hours or more. Try super-potentiating ChemBuster on your orgonite device and let us know your results! For more quality healthcare products please visit Life Quest® Formulas! * HomeoHerbal© products are the creation of Dr. William von Peters and the term HomeoHerbal© is copyrighted by Dr. von Peters and may not be used without his permission.